Hair on the head shall be neatly groomed and conservatively styled. The length, bulk and style of hair shall not preclude the proper wear of the wedge (bulk is the distance that the mass of hair extends from the skin, when groomed, as opposed to the length of hair). In particular, style and colour shall not be bizarre, exaggerated or unusual appearance. Unusual colours such as green, bright red, orange, purple, bleach blonde etc. are not permitted. Hair must be secured or styled back to reveal the face and any accessories used to secure or control hairstyles shall be as unobtrusive as possible. 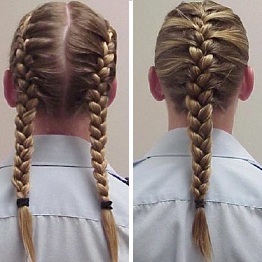 Hair ornaments shall not be worn, except for female cadets’ conservative barrettes that blend with the hair colour. Shall not extend below the lower edge of the shirt collar (see exception below).